Late in 1973 I finished my B.Sc. honours degree in physics at the University of Western Australia. After that I was not so sure what I should do. However, that summer (Nov-Dec 1973) I visited my Catholic girlfriend out in the country (which Australians call the Outback) on an aboriginal mission where she was working. I think she could not fully comprehend what was going on in my mind, though she was happy I was no longer an atheist but had become a Catholic. (We were engaged to be married when her service ended.) I grew to understand later that her service to God was some religious duty instilled in her by Catholic parents and the Roman Catholic Church, and not as a result of a new heart from a ‘rebirth in Christ’. At that time, while working out there, I met a Christian guy who told me about David Wilkerson and his work amongst the New York gangs and drug addicts, where many were miraculously delivered from drug addiction and violence through Christ. David Wilkerson was (now gone on to be with the Lord) a born-again Christian pastor who trusted God for miracles to change the lives of many young people on drugs through the miraculous power of the Holy Spirit. I read Wilkerson’s book “The Cross and the Switchblade” and then Nicky Cruz’s own story of deliverance in his own book “Run Baby Run”. Nicky Cruz was a convert to Christ under David Wilkerson’s ministry. Also I read “God’s Smuggler” by Brother Andrew, Andrew van der Bijl, a Dutch Christian who trusted in prayer and the power of the Holy Spirit to smuggle Bibles into Soviet countries, behind the “Iron Curtain”. These influences made me seek after the Lord even more and I desired to have the power of the Holy Spirit that David Wilkerson and Brother Andrew wrote about. It was this power that miraculously changed those ne’er’-do-well’s1 into children of God. It was the power of the Holy Spirit that gave Brother Andrew the grace to trust the Lord as he travelled across borders into communist countries. I believed that I needed to find a way to get baptised in the Holy Spirit, but I did not know how. By this time I understood that baptism in the Holy Spirit was additional to salvation, and like the early Apostles it was to give one power to be a witness. In 1974 I had put on hold the offered scholarship to do a physics PhD, thinking I may return after a one-year break. Also I had an offer at that time to get involved in weapons research in South Australia but that did not excite me very much. Australia, allied with the USA, was involved in the Vietnam war and had national conscription, drafting young men into the Army, which, if chosen by ballot at the age of 18, required 2 years service, and many those were sent to Vietnam. Australia ended national conscription in 1970, the year I entered university. The last ballot was drawn on 24 March 1970 (my birth date). One had 1 chance in 3 of being selected. I was not in favour of the Vietnam War, nor Australia’s involvement, though I did not protest or join the lefty communist activism on campus. But I was not selected. Not so long after that the Australian government of the day ended the draft and eventually withdrew from Vietnam. By the time I was a born-again believer, God had given me a new heart and He had started to rewire my brain (but He had only just begun). I was looking for a way to serve God and share the Good News (the gospel) with others, but I felt that I totally lacked any power to do so. With one of my best friends from university, who also took the year off, I travelled to Tasmania (the small island state off the southern tip of eastern Australia) to do seasonal apple picking. While picking apples I met some evangelical Christians and discussed the Lord and power of His Spirit to save and change people. I really started understand that God’s power was real and available to us today. It was not just for the time of the first Apostles. It was not some special dispensation for some past era. But in our time God did still does miracles and works through people filled with His Holy Spirit. It seemed the Lord put people in my path that I had to meet and they helped me see what I needed. I tried to read the Bible but had a hard time really getting what I desired from it. I believed, at that time, that this was because I had not yet received the baptism of the Holy Spirit. And because of that I sought it even more desperately. I attended a Roman Catholic church there in Tasmania. Yet I wanted to serve the Lord totally, giving my all to Him. I left the Lord had given me real hope in this life. I felt the Lord calling me to follow Him. So I spoke to a Catholic priest there, asking him how and why did he become a priest. My idea was to see if that was what I wanted. The guy, so matter-of-factly told me that he had studied commerce and accounting and when he looked at his options, becoming a priest was a much better deal. He said he gets, tax-free, a house, a car and living expenses. So, that did not inspire me at all. The truth is, his testimony spoke to me strongly that the Roman Catholic Church was not the true way of God. They are graven images, made in the likeness (so they think) of Christ and Mary (the earthly mother of Jesus Christ, she is not God, but a human being), and they do bow themselves down to them. They do not say they hate God but they do not worship God in spirit, but in stone, which God hates. I was starting to see that this is the false church. The priest I spoke to did not even seem to know Christ. Though let it be said I know now there are many in the Catholic Church who are saved Christians, through faith alone, not because of the Church or belonging to it, but in spite of it. This was my own story, and my wife (not my girlfriend I write about here) spent the first 17 years of her life attending a Catholic church. But she does not remember a time when she did not trust in the Lord as her Saviour. At that time, I was praying one night and the Lord gave me a vision of Indonesian or Malaysian children, which I interpreted to mean that I would go there for Him one day. He told me to be a ‘priest’ for Him. Looking back now I know that is what I became, but I only had the limited knowledge of those priests in their ecclesiastical robes, which seemed to me then like death itself, whereas the Spirit makes alive. But I could not find a place like a Christian family (Psalms 133), though I was looking for a true Christian fellowship. Also I really craved to be a witness for my Lord and wanted to find someone who could tell me how to get the power of the Holy Spirit. I believed that that was the power I needed, which I sorely lacked. It was what powered the changes in lives of those in those New York gangs that David Wilkerson wrote about. They had instant healing from strong drug addictions and I wanted God’s power to be real in my life, because I felt so weak. 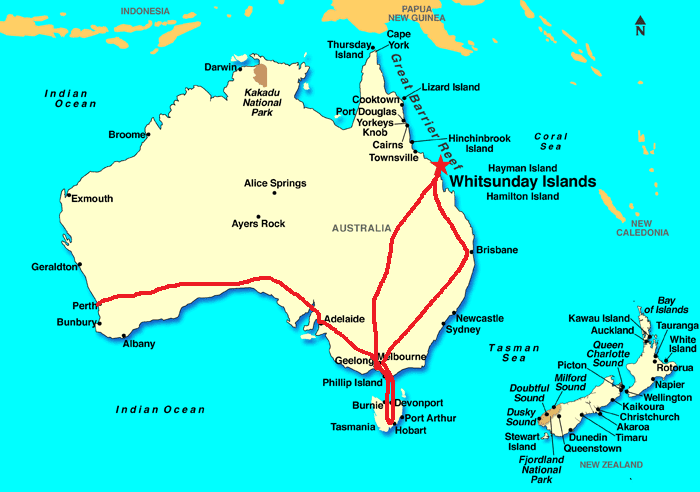 After leaving Tasmania, with my friend, I hitchhiked to northern Australia, to the Whitsunday Islands off the coast of Mackay, in Queensland. We found a sailing boat operator who dropped us off on one of the islands, and we arranged for him to return a week later to take us back to Mackay on the mainland. We were totally alone on the island, as far as we knew. Map of Australia showing the travels I took from Perth, through Adelaide to Melbourne, by train, then by plane to Hobart, Tasmania. After 3 months of apple-picking there, I hitch-hiked from Melbourne to the Whitsunday Islands via Brisbane. Then back to Melbourne and caught the train to Perth via Adelaide again. We thought maybe we’d ‘find’ ourselves on that deserted beach, eating coconuts and whatever we took with us. But it was not that great. I was disappointed. Paradise on Earth is imagined more in the mind than in reality. God though continued to speak to me and lead me. I got a very strong sense that I needed to return to Perth, Western Australia, which by now was about the most distant place on the continent of Australia, on the opposite side. See the map here. I got out on the road in Mackay, Queensland, to hitch-hike down to Melbourne, alone this time. A guy picked me up in his car. He was headed to Melbourne. I was amazed. I had prayed that God would give me a nice driver, and a long continuous ride back, not many small lifts as is common with hitchhiking. It was indeed. That journey is 1500 miles (2400 km) and we drove non-stop almost. As we approached Melbourne, I was driving and he was asleep. I noticed the petrol gauge was on empty, but we were 100 miles from any petrol (gas) station. I prayed and kept driving. Well, I drove that car about 100 miles (160 km) on an empty tank (as far as I could tell from the gauge) and we got into Melbourne early the next morning. When he woke up and I told him I had been driving on empty for so long he was surprised. By this time I had been away about 6 months, and many young people I met or worked with were hippies,3 many of whom were doing drugs of one kind or another. The hippy movement was a counter-culture lifestyle of rebellion against the former Christian culture of the West. They said they were rebelling against their parents’ generation, the Vietnam War and anything of the system. It was powered by the so-called Peace movement and had a background of rock’n’roll music of the Beatles, the Rolling Stones and others. I also met various Christian types. In 1974, among others these included Jesus People,2 and the Children of God. There were those who ran Christian coffee shops, which was a new phenomenon. There was a Jesus Revolution going on, which started in America, on the West Coast, by David Brandt Berg and his family. Their ministry was called “Teens for Christ” an outreach to the hippies. This spread to other groups and the Jesus movement spread to Canada, then Europe and some came to Australia in 1973. 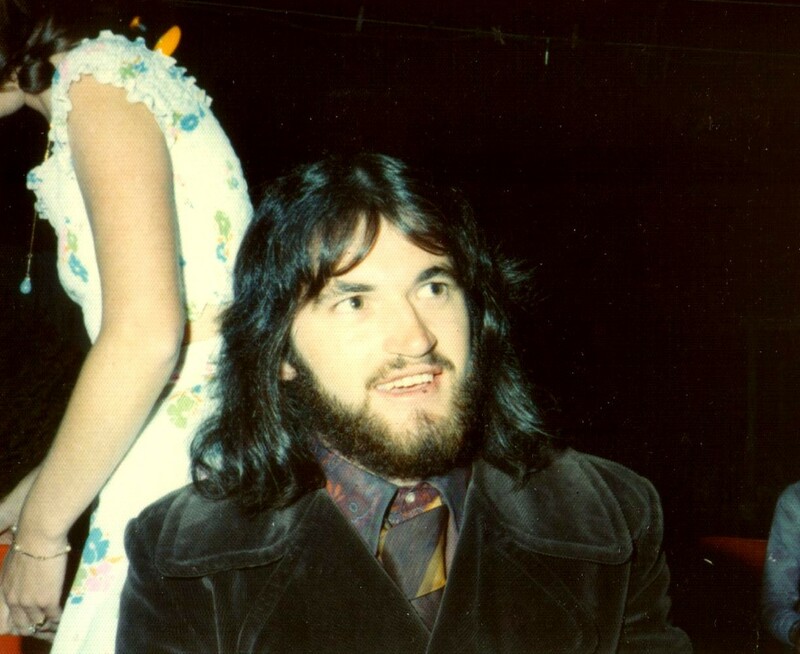 At this time I was meeting different former hippies who were serving Jesus. But they were very different to the Catholics or even to those Christians I had met from the mainstream protestant churches. From meeting these different Christian groups in both Melbourne and Adelaide I knew that without the power of the Holy Spirit I did not have the power to witness. I saw what they were doing—street witnessing Christ to the world—I wanted to but I just did not have the power, though I tried. They had what they called the “Message of Jeremiah”. Here is the “Message of Jeremiah” in song. Those Children of God were not allied with any denominational churches, but worked to together using the book of Acts as a blueprint. They believed, as I came to understand, that God was not happy with the so-called “Christian West” and they believed that the America and the post-Christian nations needed to get right with God. This included the established churches, who needed to look to God in repentance and obey His commandments. December 1973 I had seen the Children of God on the streets in Perth where they used the arrival of the comet Kohoutek4 to preach God’s judgments on the wicked. I never spoke to them then but I remembered that later. They preached a 40-Day message of repentance, to get right with God. By that time I heard the Lord clearly telling me that to serve Him I had to forsake all—that I could not have any preconditions. God accepts nothing less. I told the Lord I had given up everything, quit my career and would not go back to do a PhD, but would trust Him to show me how to serve Him. But I could not ‘put my girlfriend on the altar.’ Because I so greatly loved her, I kept holding onto her, telling God that He could have everything else. It was impossible what He was asking of me. So in my mind and heart a battle raged, which broke me more day by day. I now know that God used that to break me down, to make me and prepare me for His use, His way. On arriving home, in Perth, on the west coast of Australia, I knew I had to find the Children of God as I saw that they had the Holy Spirit and they were daily witnessing. I found them on the street in the city and I went to their house. The battle inside me was still raging all the way to their house. It was as if Satan was resisting me all the way. Only as I arrived there and they open the door did it cease. I can’t express in words how miraculous that was in itself. I asked them if they could pray for me to receive the Holy Spirit because I wanted to be a witness for the Lord. There was a young couple and a few other young adults sharing a house, which they used as a base for outreach and bible study. They laid hands on me and Holy Spirit came into me. I had the feeling of being filled with warm oil slowing filling me from my feet to my head. It was truly amazing and life changing. And I was so inspired by this. I am not saying that this was the first time the Holy Spirit came to me, because Scripture clearly teaches that we have the Spirit from rebirth, but I am saying this was some sort of filling to overflowing. I cite Acts 19:1-6 as scriptural precedent. I was not expecting what happened, so it was not some emotional reaction my mind created. But it was almost a dizzying experience as I felt elevated out of myself or something like that. I am not promoting faith based on feelings. But God is not an unfeeling God and He moves sometimes in strange, almost mystical, ways. What attracted me to this ecclesia (Greek: ἐκκλησία)—an assembly—of dropped out ones (as they put it)? Without doubt it was their devotion to the Lord, their zeal, and their love for one another. The Children of God taught the Bible. They believed in memorizing it, reading it every day, all day. They carried Bibles with them everywhere, using it as the standard. They only used the King James Bible, based on the argument that it was the best translation.5 That was something that David Berg strongly emphasized and I believe the basis for why God brought so many to Christ then. I went around each day and studied mostly the Bible, on practical living for Jesus. They followed the blueprint of Acts and taught the whole counsel of God. Carrying the gospel message to the lost was the main focus. So I went with them onto the streets of Perth and found it so easy to share the gospel with people, just starting with some basic verses on salvation, like these. The message was always that God’s sheep are out there and we/I needed to find them. It truly was a work of God who remade me completely. In hindsight, God works in strange ways, sometimes through very unusual agents. It was like God had created a vacuum in my mind and the only way was to fill it with his Word. I was easily memorizing 10 scriptures per day which went on for many months (which I continued for many years at a lesser rate). Nothing else really mattered at that time. I remember when I went out witnessing on the streets I perceived it as if everyone was walking around in a trance, like they were just robots, mindless robots. It was so exciting to talk and witness the Lord to the lost and I shared my testimony where I could. I felt like I was charged with Holy Ghost power. Now my parents really thought I was crazy. But I had the ability to just talk to anyone, without fear. The Spirit had overcome that problem. We would dress up in costumes and we’d do crazy stuff, street skits etc to attract attention in order to preach the gospel to the crowd. I wrote to my girlfriend to tell her all that was happening and how exciting it was serving the Lord. I quoted her Scriptures that I had memorized and I told her that I have ‘forsaken all’ to follow Jesus Christ. My girlfriend wrote back telling me that I had become too religious for her and she broke off our engagement. I wasn’t surprised at all because I had already forsaken her in my heart; she was firmly on the altar. I would add too that God never takes something from you without giving you something better, for His glory and purpose. Because that is when I met Christina, who several years later become my wife and we have served the Lord together ever since. God so changed my heart that even though I had really loved my girlfriend, and wanted to marry her, I had no grief when she wrote breaking it off with me. I loved the Lord so much more, it just did not matter. I think it was a work of the Holy Spirit in my heart. Now I really wanted to hear from God in prayer. I really didn’t know how God spoke even though all this time God was speaking to me, to my heart. I would pray each night for God to speak to me, sometimes asking for hours. One night He spoke, well, it seemed like to me that He said, “I don’t speak in an audible voice.” My best recollection is that it was a rebuke to me, to just listen in the stillness for His voice in my heart—a still small voice. Around that same time, while I was praying and praising God, as I would do every night before bed, in just praising Him, I also began to speak in tongues; it freed me to praise him. It was something quite marvellous that happened. It was like a release of my spirit to just communicate with the Lord. When I had left my father’s house 6 months earlier, I had left there thinking that I was not going to return to live there. My father had told me to ‘move out’, as I had had my time there while at university and now it was time to move on. He had said so. But when I went back to move my stuff out, he was shocked that I was moving out. I told him that I was going to follow Jesus Christ, as His disciple. But it only made him angry. He had developed hatred for God from his younger days in a Catholic school and this he equated with that same God—incorrectly so. If the things of the world are growing strangely dim, we’re on the right track. If the world doesn’t feel like our home, we’re on the right track. One day I was having a conversation that brought me to mention my views, still held from my past, on the origin of the Universe. I, so-matter-of-fact, said, I believed in the big bang and evolution. My mind was not yet converted in that area. I had not even really thought about it much and had not read the book of Genesis yet. Then a brother directed me to the book of Genesis, particularly the first 11 chapters, and asked me to read it and seek the Lord as to its meaning. So I did and God showed me that His history in Genesis (the Creation, the global Flood in Noah’s time etc) made much more sense than the big bang, evolution and millions and billions of years of earth history. Over one weekend I was converted (almost instantly) into a biblical creationist. All that university education on the false history of our universe and the origin of mankind was wiped away by revelation from the Holy Spirit. He opened my eyes, the scales were removed, and I saw that it is really all about the authority of the Scripture. It is the clear narrative history (in Genesis 1-11), the plain truth despite what man has tried to read into it and reinterpret from it. Exodus 20:11 says it all. Who was I to argue with that? Follow Christ in a life of witnessing His Good News to the world! http://en.wikipedia.org/wiki/Comet_Kohoutek. Professional astronomers got it wrong on this comet and it did not manifest as the brightest ever. The Children of God gave a warning message of 40 days and the judgments of God would come on the wicked of America (if I remember correctly). But nothing really much happened. I found it attracted me to them though, but I didn’t think about this until a lot later. I have only recently learned that what remains of them today now use the ESV. That version is largely based on the Vaticanus B and Sinaiticus Aleph manuscripts that form the basis of nearly all modern Bible translations. Those manuscripts (the Critical Texts) many (but probably a minority today) scholars believe to be corrupted. When Erasmus was compiling the Textus Receptus (the Received Text), which is the Greek texts upon which the King James Bible translation was based, he considered those manuscripts as spurious and did not use them, even though they are believed to be older than the many thousands of extant Greek manuscripts (the Majority Texts), which agree with the Textus Receptus. Older does not guarantee better. I still maintain the KJV is the best translation. If you want to read it without archaic words or Jacobean language use the KJVER, the King James Version Easy Reader. This entry was posted in Evolution, Salvation testimony and tagged Andrew van der Bijl, Australia, Brother Andrew, Catholic Church, Children of God, Christ Jesus, Creation, Creator, David Berg, David Brandt Berg, David Wilkerson, Forsaking all, hippies, Holy Spirit, idol worship, Jesus Christ, Jesus People, John Hartnett, Lord Jesus, Lord Jesus Christ, Message of Jeremiah, Nicky Cruz, Roman Catholic Church. Bookmark the permalink.